When I was about seventeen or eighteen I checked Jim Bouton's Ball Four (once considered to be mildly scandalous) out of the Mancelona Township Library and read it. My dad had already read it. I would bet the library has long since purged this tome from its shelves, along with scores of classics, to make room for the pulp fiction which seems to be its mainstay these days (cue a deep sigh). But, after thirty-some-odd years, I'm rereading it. Here are a few quotes. 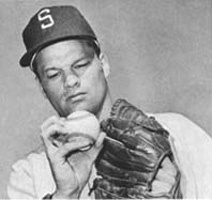 Pitched three innings, gave up five hits, one of them a tremendous home run over the left-field fence by a guy who caught me in Seattle last year ... Tommy Davis said he could follow the flight of the ball pretty good, until he lost it in a cloud. A very bad day for the knuckleball. More conversation about positive thinking today. When I pitched in the World Series in ’63 and ’64 I won two out of three games and the only thought that went through my mind was, ‘Please don’t let me embarrass myself out there.’ No thought of winning or losing. If you told me beforehand that I would lose the game but it would be close and I wouldn’t be embarrassed, I might well have settled for that. I was terrified lf being humiliated on national television and in front of all my friends. Now, that’s certainly not positive thinking, and yet I was able to win ballgames. Maybe there is a power to negative thinking. We agreed we’re both troubled by the stiff-minded emphasis on the flag that grips much of the country these days. A flag, after all, is still only a cloth symbol. You don’t show patriotism by showing blank-eyed love for a piece of cloth. And you can be deeply patriotic without covering your car with flag decals. I mean, what if I screw up a man’s career? I’m going to have that on my conscience for … well, for weeks maybe. It’s difficult to form close relationships in baseball. Players are friendly during the season and they pal around on the road. But they’re not really friends. Part of the reason is that there’s little point in forming a close relationship. Next week one of you could be gone. Hell, both of you could be gone. So no matter how you try, you find yourself holding back a little, keeping people at arm’s length. It must be like that in war too. A kid named Tom Byrd, who belongs to the Seattle organization and goes to school here, came over to work out with the club. And before the workout he was in the clubhouse shaving off his nice long sideburns. He got the word that Dewey Soriano, who is the president of the club, thought he would look better with shorter sideburns. Well, I think Dewey Soriano would look better if he lost weight.